Soldiers have opened fire on a group of Pemon Indians, killing a woman and wounding at least 25 people. Four more Pemon have since died from wounds sustained in the attack. It is reported that some Pemon have been arrested and detained by the authorities. 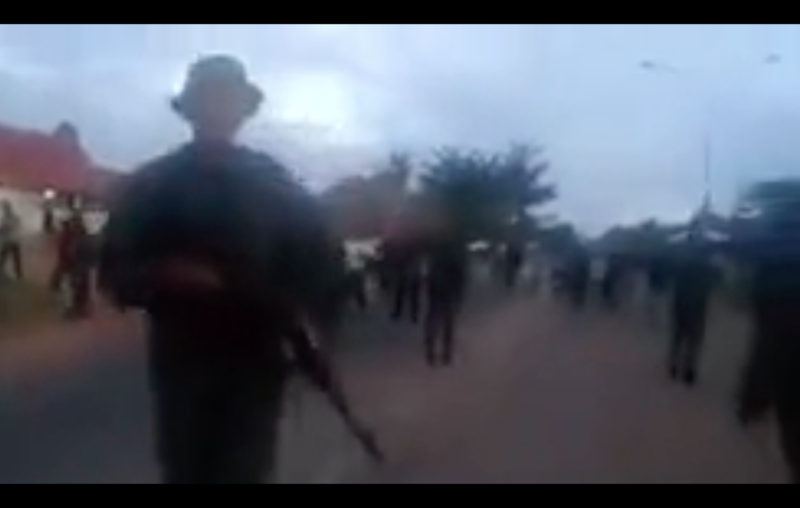 The shooting took place on 22 February near the border with Brazil. The Pemon of Kumarakapay community (also known as San Francisco de Yuruaní) had set up a road blockade to prevent army troops from reaching the frontier. President Maduro had ordered the border closed to prevent humanitarian aid from Brazil entering the country. In response to a petition from the Venezuelan NGO Foro Penal, the Organization of American States has written to the Venezuelan government expressing its grave concern at the situation and requesting that it uphold the rights, and guarantee the safety, of the Pemon people. There has been tension in the last months between Pemon and the army in response to the increasing militarization of their territory. Last December a Pemon man was shot dead and two Pemon wounded by military counterintelligence troops in an operation to clear illegal goldminers from the area. The operation was to pave the way for the huge Arco Minero Orinoco (Orinoco Mining Arch) project, which would see Pemon and other indigenous territories opened up to large scale mining. Many indigenous communities are deeply opposed to the project, having already suffered the devastating impacts of large- and small-scale mining. The Pemon people of Venezuela number over 30,000 and live mainly on the Gran Sabana (a spectacular highland area of natural savanna), and in the Upper Caroní basin and lowland Imataca rainforest. There are also several thousand Pemon in neighbouring Guyana and Brazil, where they are often known as Arekuna and Taulepang. Much of the Gran Sabana lies within the Canaima National Park, an area of 2.4 million hectares, created in June 1962 to protect this unique area. It was recognised as a UNESCO World Heritage site in January 1994. For the Pemon, the spectacular flat topped mountains, and waterfalls like the Angel Falls, the highest in the world, are sacred. Many of the plants that grow on top of the mountains are found nowhere else on earth. Biologically diverse, the park also contains a number of endangered species, such as giant anteaters, giant otters and jaguars. The Pemon cultivate manioc and other root crops like sweet potatoes and yams. Bananas, plantains and pineapples are also grown. This is supplemented by hunting and fishing. Palm trees provide housing materials and fruit. Some Pemon villages on the savanna have set up small scale tourism to earn a cash income. Pemon lands have been targeted by successive Venezuelan governments for mining and logging, and small-scale goldminers have operated illegally here for years, all of which has had a devastating impact on the environment. In the 1990s, with support from Survival, the Pemon opposed the building of a huge electricity line and pylons which cut through the heart of their territory to take electricity to Brazil. Despite a vigorous campaign the government pushed the project through.